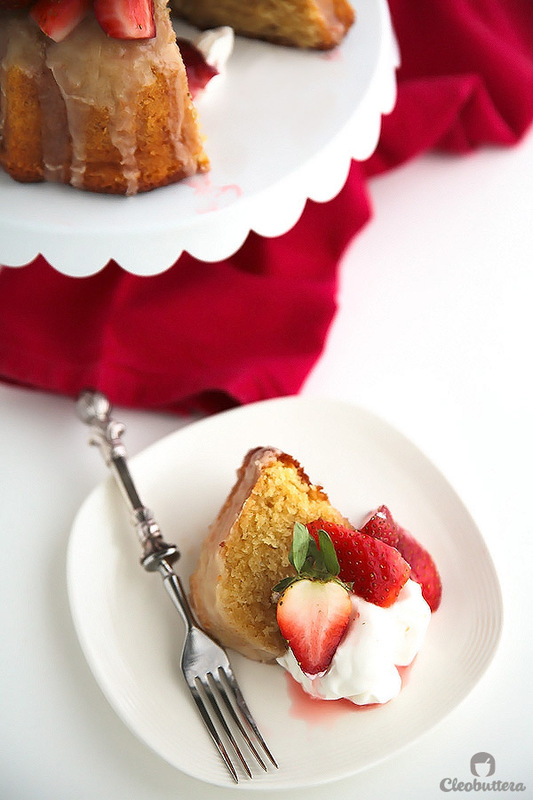 The moistest, most tender and flavorful vanilla bundt cake you will ever meet. Served alone, it makes the perfect everyday tea cake, but sided with macerated strawberries and whipped cream, makes it worthy of a special occasion. You know these cakes that sit so “innocently” on the counter throughout the weekend, and unconsciously pulls you in for a sliver after a sliver, until before you know it, its halfway gone and never actually makes it through the weekend? Yeeeeaaaaah, well this is one of those cakes. Give yourself a high five and a Willpower Award if this cake survives more than a day at your house. 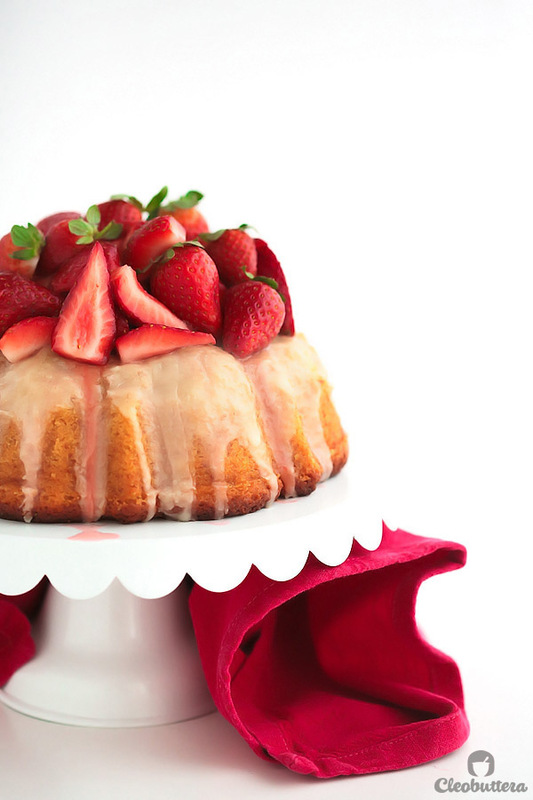 The macerated strawberries are something, but the cake itself is a whole other story. I.N.C.R.E.D.I.B.L.E! THEEE most perfect vanilla bundt cake out there and I’m not even scared to to say it! 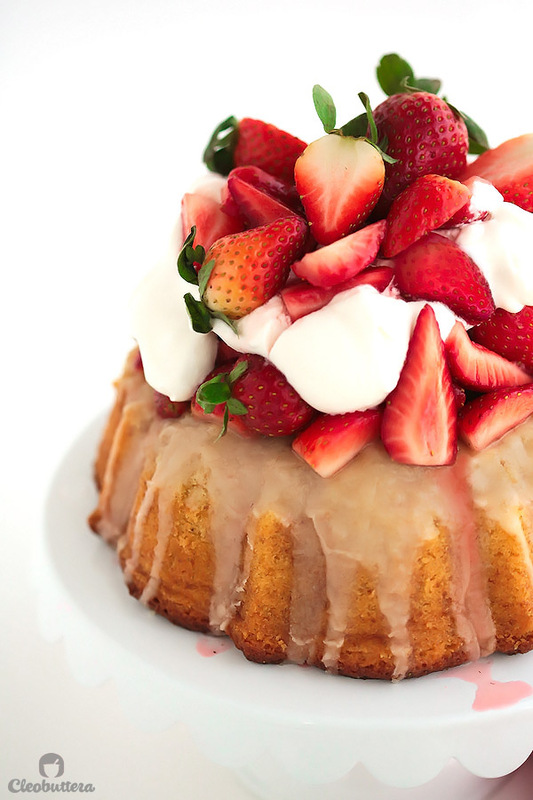 Yes its THE BEST and I have no doubt that this will be you go-to bundt cake from now on too. 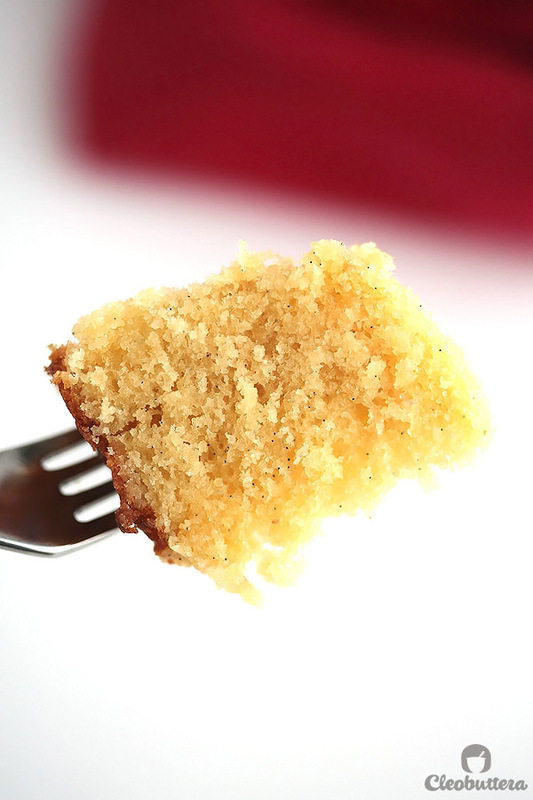 The cake is a vanilla explosion with a tender crumb that just melts in the mouth. It is moist beyond belief and stays like that for days and days. It has the tenderness and fluffiness of a yellow cake, with a tighter crumb like that of a pound cake but not as much. Glazed, it will remind you of a vanilla cake doughnut…Uh huh! The cake is so versatile. Dress it down and serve it plain for an everyday snack with your tea or coffee, or dress it up with macerated strawberries and whipped cream for dessert. Or both and top that with vanilla ice cream. Here’s a little behind-the-scenes secret…My cake looks like crap on top! I didn’t spray the pan well, so the cake stuck to the bottom. When I tried to flip it…I was greeted with 3/4 of a cake. The other 1/4 was still sitting there in the pan. Looking at it in despair, I sucked in my tears, wore my tough gal pants, did a little patchwork and went with the decision of piling the strawberries on top instead of on the side to cover up the mess. And you know what? As far as photography goes, best decision ever! But as far as the cake’s texture is concerned, it wasn’t ideal (at least for me) because the juices from the strawberries soaked into the cake after standing for a long time, making the cake’s top somewhat soggy. With that said, it’s up to you whether you want to serve your strawberries on the side or on top. Or even at all. Bake for 35-40 minutes until a beautifully golden brown and a toothpick inserted in the center of the cake comes out clean. Let it cool for 15 minutes then invert onto a wire rack. Then drizzle on that glaze. This is what makes it taste like a donut so don’t skip it. While the cake is cooling, macerate the strawberries, which is a fancy word for saying extracting the natural juices of the strawberries. 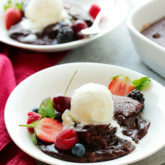 By sprinkling on a few tablespoons of sugar onto the strawberries and leaving it for about a 30 minutes, the sugar dissolves, sweetening the strawberries and magically making a fast strawberry sauce. Yum-O! As I said, either top it on the cooled cake and serve on the side. Its a textural thing so go with what you prefer. And how can whipped cream ever be a bad idea? Might as well add some of that, because I mean…strawberries ‘n cream? 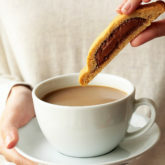 Cut yourself a small wedge…or big…and enjoy. Before I leave you to go enjoy this, I just have to show you the crumb of this thing. Will you look at the vanilla seed-speckled fluffiness. So good. Now I’m ready to say goodbye. 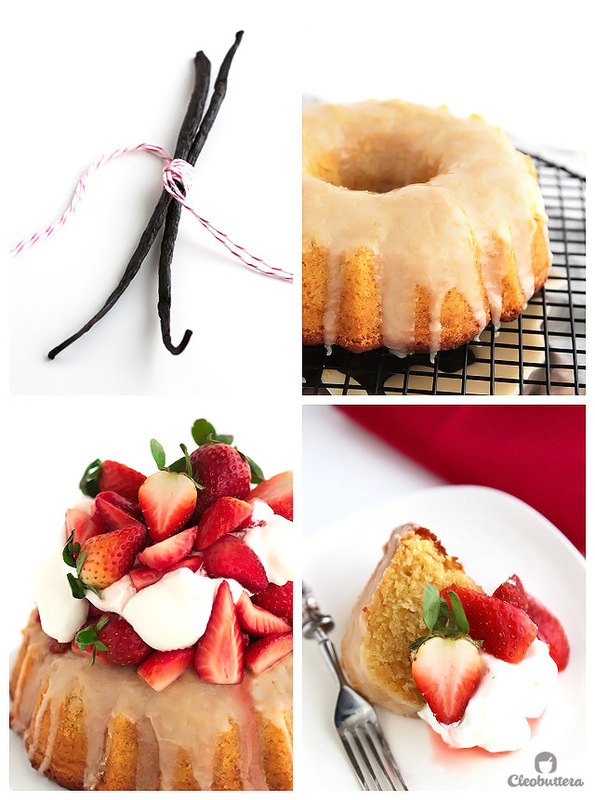 The moistest, most tender and flavorful vanilla bundt cake you will ever meet. 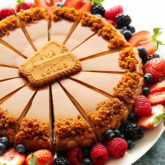 Served alone, it makes the perfect everyday snack cake, but sided with macerated strawberries and whipped cream, makes it worthy of a special occasion. Position rack in the lower center of the oven and preheat to 325F/163C. 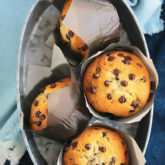 Generously coat the inside of a 6-cup bundt pan* with nonstick cooking spray, or butter it thoroughly, dust it with flour, and knock out the excess. 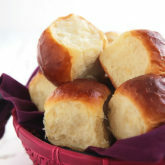 In a medium bowl, whisk the flour, baking powder, and salt. Set aside. In the bowl of a stand mixer fitted with a paddle attachment (or using a handheld electric mixer), beat the butter until creamy, about 1 minute. Add both sugar and beat together until lightened in both color and texture, about 5 minutes. Add in the eggs and egg yolk, one at a time, until well blended after each addition. 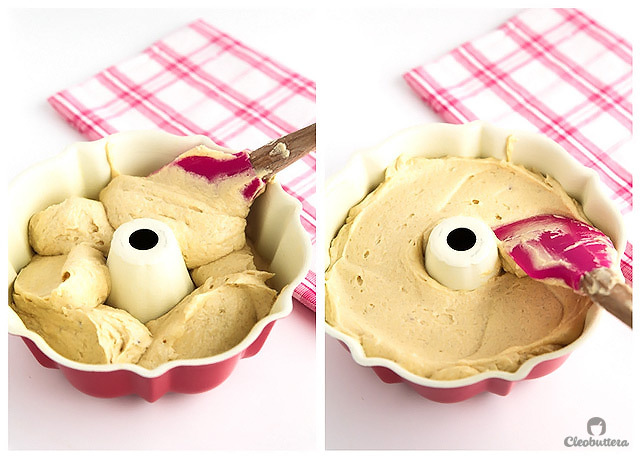 Scrape down the sides and bottom of the bowl, then beat again for 15 seconds. Add the vanilla mixture and beat until well blended, about 20 seconds. Turn the mixer on lowest speed, then add in half of the flour mixture, blend lightly, then stream in the buttermilk, followed by the rest of the flour mixture. Beat just until combined; do not overmix. Batter will be very thick and might look slightly separated and that's perfectly fine. Transfer the batter to the prepared pan and smooth the top evenly. 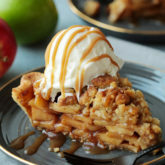 Bake for 35 to 40 minutes or until a toothpick inserted in the center comes out clean or with a few cooked crumbs attached. Transfer the cake to a wire rack and let cool in the pan on a wire rack for 15 minutes. Carefully invert the cake on the wire rack to cool. 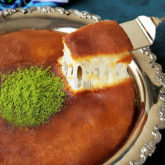 Cake can be glazed while still warm or after cooling completely. Details below. In a small bowl, whisk all ingredients together. The glaze should be loose enough to drizzle. 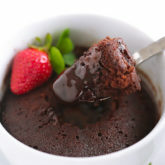 (If too thick, add a little more milk; if its too loose add a little more powdered sugar. Place a piece of foil under the wire rack to catch any dripping glaze. Drizzle the glaze on the cake in a zigzag motion. 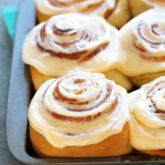 Allow the glaze to set for 15 minutes before serving. (Glazing while cake is still warm will make the cake soak some of the glaze leaving a very thin, translucent shell of a glaze (as pictured). While glazing on a cooled cake will result in a thicker, whiter and more defined glaze (prettier, but its your call). 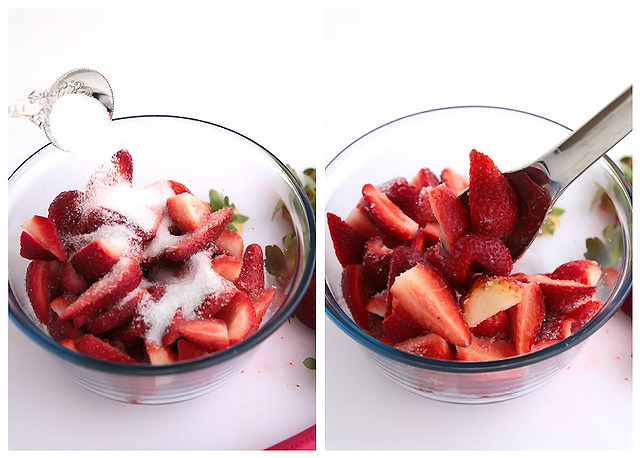 While the is cooling, toss together sugar and strawberries in a medium bowl. Let stand at room temperature, tossing occasionally until juices form; about 30 minutes. If you don't have vanilla beans or paste, no worries...just omit it and double up on the vanilla extract/flavoring quantity. Weighing ingredients, especially flour, is ideal in baking due to its consistency. If you don't have a kitchen scale to weigh the flour, use the Spoon & Sweep method: Use a spoon to lightly fill measuring cup with flour until required amount is obtained, then sweep access with the back of a knife. 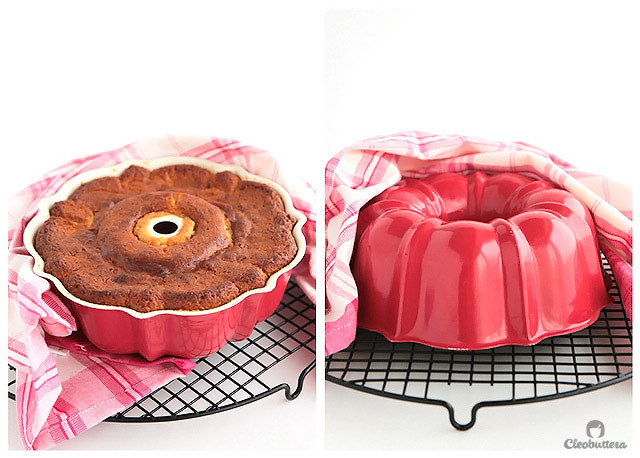 If you don't have a 6-cup bundt pan, you can make it in the classic sized 10-cup pan. It will be shorter but equally delicious. 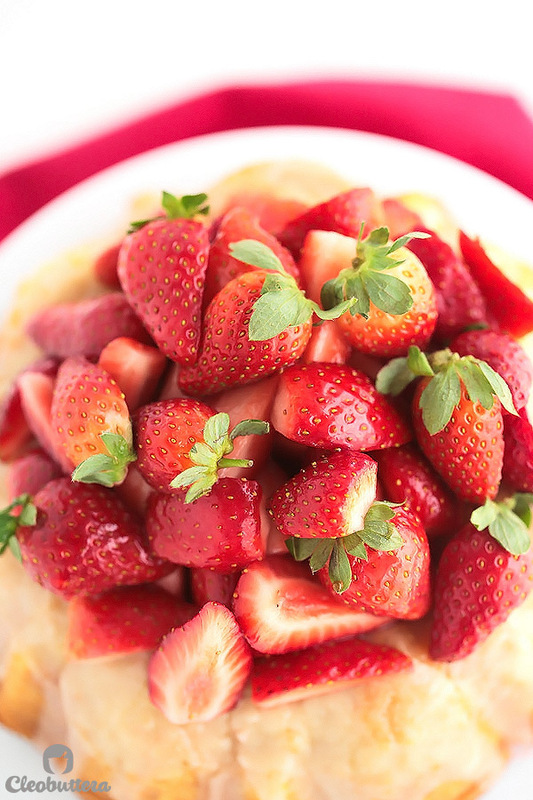 The macerated strawberries were placed on top of the cake in the pictures for photographic purposes. 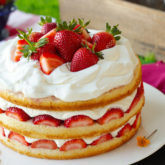 I'd recommend, spooning the strawberries alongside individually cut portions rather than topping the whole cake because the strawberry juice will soak the cake if standing for a long time. 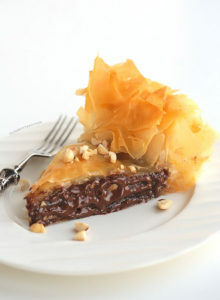 Cake can be made a day ahead, stored under a cake dome or an airtight container at room temperature. 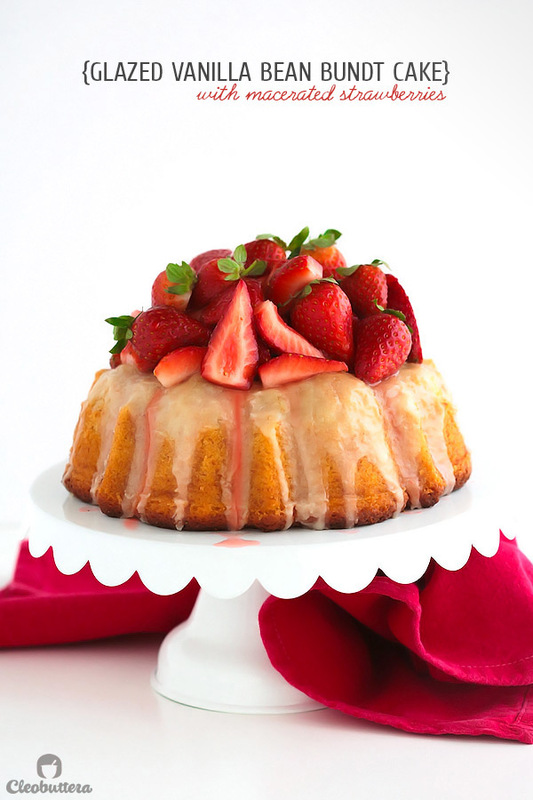 Love this beautiful bundt cake.. the macerated strawberries and glaze really make this cake! Wish I had a slice right now. I made this tonight for my hubby and it was perfect! Really simple for me to make and it smelled soooo delicious when I took it out of the oven. I used 1/2 tablespoon of vanilla since it was made with alcohol and it was just right. I made mine in a 8×8 since I don’t have a bundt pan. Thank you for the recipe! Thank you! I agree, I think this cake recipe is a really great all purpose cake. I’ll be using it often! I have just discovered your page and I am truly in love with it. I absolutely love your ideas and your recipes. Keep up the good work! Thank you so much Amany. So happy to have you stop by. I made it!! First time to bake a good cake since I got married! It’s not just good, it’s absolutely the yummiest u can ever eat! Thank you for all the minor details that helped me bake a successful cake! I wish you could see me right now as I’m doing a happy dance for you:))) Congratulations!! I’m honored to have contributed to this milestone of yours:)) I wish you many more successful cake baking to come. If J dont find buttermilk what should I use? Hi Walaa 😊 Buttermilk is just Laban rayeb. Since it’s widely available and what helps make this cake so good, I really don’t recommend using anything else. As for the vanilla beans, you could just increase the amount of vanilla extract. You’ll still get fabulous results. Since this is a cake I make often, I don’t always use vanilla beans because they are quite pricey. In that case, I just use vanilla extract instead. If you live in Cairo, you should be able to find vanilla beans at Petro supermarket and Gourmet Egypt. How much vanilla bean i should use its written only 1 1 spoon or 1 cup? I’m sorry I don’t really understand the question. Did you mean how much vanilla extract you should use? If yes, then 1 1/2 tablespoons should be enough. Hey Walaa! I’m so happy you’re trying a lot of recipe 🙂 So you want to use this instead of the granulated sugar? No i meant instead of vanilla bean ? If im using vanilla extract instead how much should i increase it? It sounds like it should work. The vanilla bean be it extract, powder or sugar is just there for flavor. So it’s up to you on how strong you want the flavor to be. When I use extract in liquid form, I use about 1 1/2 tablespoons of it. Could you please tell me what the brand of vanilla powder you’re using so I could better help you? I found vanilla bean dusting sugar in tylor and colledge brand. Hi Tasbih! Where do you find vanilla bean? Can i substitute with imitation liquid vanilla? Hey Naela! I always get them from Petro supermarket in Mohandiseen. 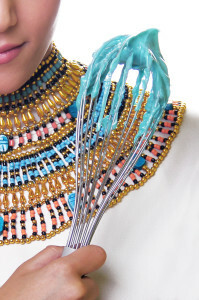 They are also often available at Gourmet Egypt; you could check their website. And sure! 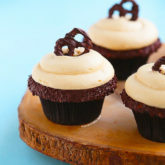 You could use imitation vanilla extract instead, the vanilla flavor just won’t be as strong, but still every bit as delicious. I’d use about 1 1/2 to 2 tablespoons of it. I can’t wait to try this recipe! 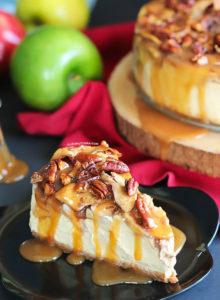 I absolutely love your perfect caramel cake recipe. I make it all the time. Hopefully this recipe will be as successful! Thanks so much for sharing. 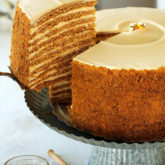 Oh I’m happy to hear that you’re loving the caramel cake…it’s one of my personal favorites! I hope you like this one just as much. Can I use the following formula for buttermilk? 1 cup buttermilk = 1 Tablespoon lemon juice/white vinegar + enough milk to fill to 1-cup line. Hi Manali! Although I’m partial to real buttermilk, because through experience, I’ve noticed that it yields for more superior flavor and texture, the substitute will work in a pinch. Im sorry, but what is real buttermilk? For me, buttermilk has always been curd + water. is this correct? if yes, in what ratio? Not sure about the ratios Manali. In Egypt, it’s sold right next to the regular milk & it’s labeled ‘Rayeb.’ It tastes like thinned yogurt; tangy & slightly sour. 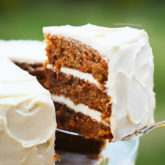 Can this recipe be used for a layer cake? I made the cake in a bundt pan and it tasted awesome!!! I did not add the glaze and still the sweetness was perfect. Hence, if I convert it into a layer cake and then add frosting, do you think the cake will turn out to be too sweet? Hi Manali! I’m really happy you love this cake. I think it’s a great all purpose cake with a lot of versatility. I did actually use this recipe once as the base of an upside down cake with amazing results. I’ve also made it into cupcakes & it wasn’t overly sweet at all. I think you’re gonna be happy with it in layer cake form. I totally love your recipes..and i have baked quite a few so i don’t ever feel the need to do a ‘trial’ before the main event! They are always so perfect! I’m really glad you feel this way about my recipes Manali…what an honor?! I’m so excited to start experimenting with macarons soon! Will definitely be sharing the results if all goes well. Thanks for all the love! Sending much more back to you. Hi dear, i am a huge fan of yours. 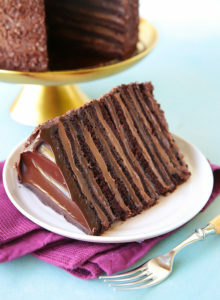 Can u plz tell me which chocolate brands did u use in the 12 layer chocolate cake? And where can i get buttermilk in egypt? Hi Nour! Thank you so much for your support. I’m so happy you like it around here. I get Belgian chocolate from a bakery supply in Cairo. The company’s name is Al Safi. If you’d like their contacts please shoot me an email or DM on Instagram & I’ll be more than happy to give them to you. Can I use this recipe for cupcakes as well? if yes, any idea how many will they bake? Hi Manali! 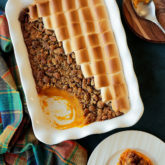 So glad you love this recipe so much! I actually made them into cupcakes with fabulous results but it was years ago, so I can’t really remember the yield. Judging by the amount of ingredients, I would estimate it would make 12-14 cupcakes. 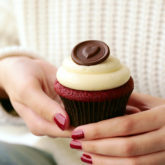 Just be sure to fill your cupcake liners no more than 2/3 the way up and they should turn out great.